The Thruxton 900 draws on the Spartan cafÃ© racing machines of the sixties and takes its name from the rare and near mythic racing Triumphs of that era. 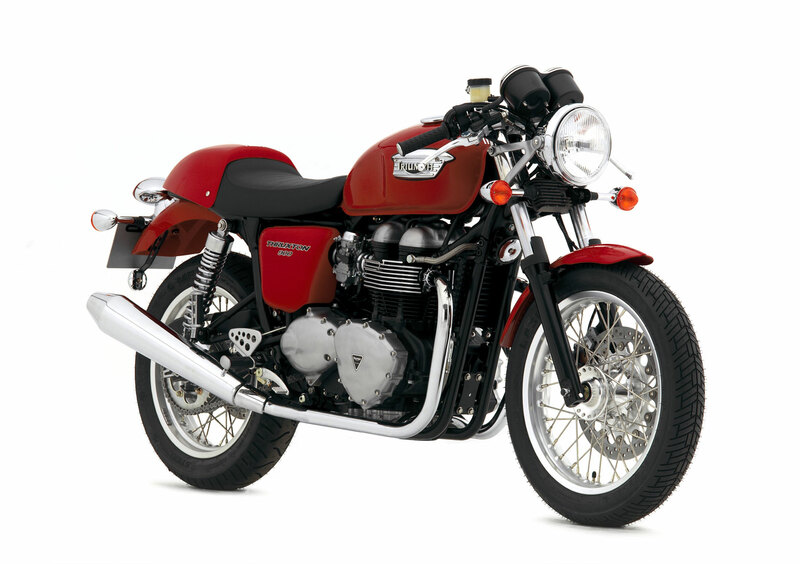 With its perfectly proportioned, evocative silhouette the Thruxton is a truly beautiful machine. It captures the very essence of the cafÃ© racer look – the shorty-style front mudguard, rakish clip-on handlebars, distinctive seat hump and Spartan elegance – and matches it to exhilarating, fluid performance. 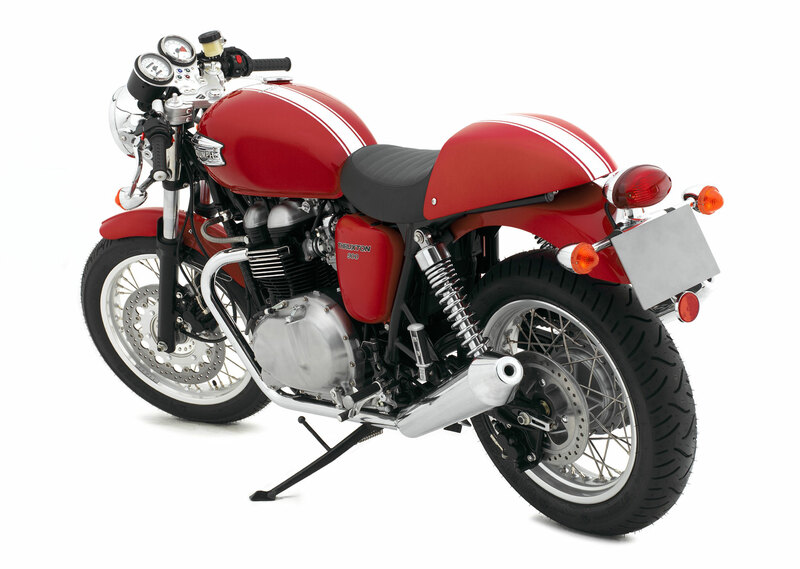 The Thruxton fires the imagination of many of today’s younger riders who seek a distinctive and involving bike, where the classic style of the sixties mixes seamlessly with a modern attitude. 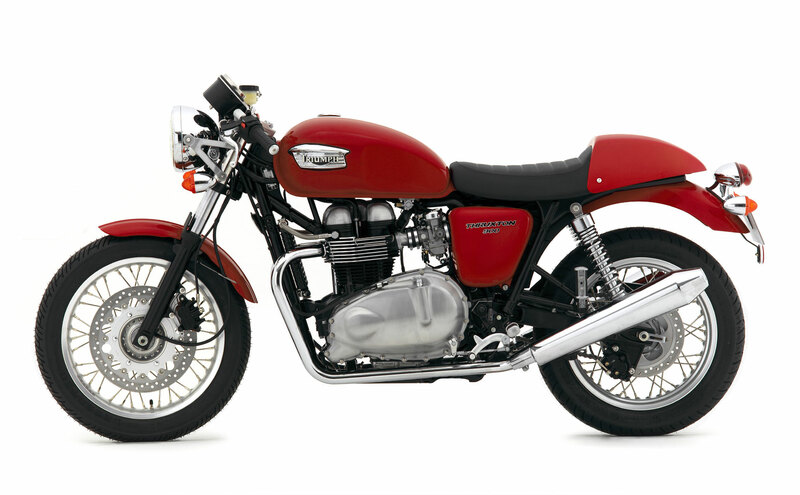 Its 865cc air-cooled twin cylinder power plant is the most powerful of Triumph’s twin-cylinder line up and while it shares the 360° firing interval of the Bonneville, also features ‘hot’ camshaft profiles, a compression ratio of 9.2:1 and megaphone-style exhausts. 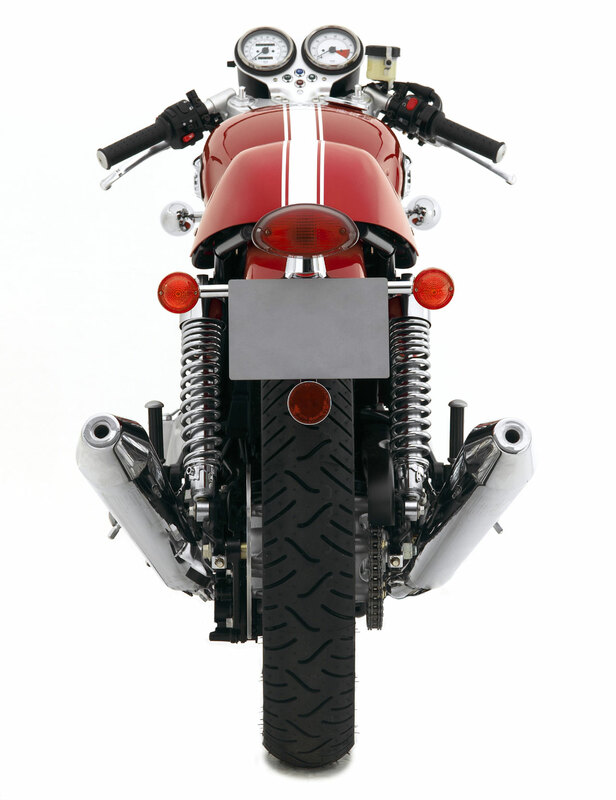 Peak power output of 70PS (69bhp) is delivered at 7200rpm and peak torque of 72Nm (53ft.lbf) arrives at 6400rpm. Wrapping the motor is a precisely crafted chassis that inspires confidence; its harder edge delivering real sporting character. The sturdy, preload adjustable 41mm telescopic forks and twin rear shocks give superb suspension action and compliance while sharper steering geometry, a wheelbase of 1490mm and 18in aluminium-rimmed front wheel all aid steering input. 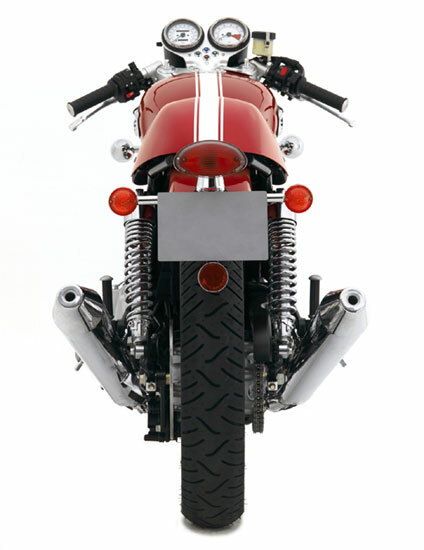 A fully floating 320mm front disc and twin-piston brake caliper provide powerful, but sensitive, braking performance and the tubular steel twin cradle frame and box section swingarm easily contain the engine’s power output. 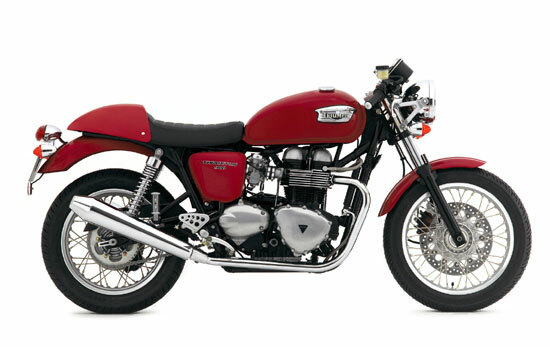 Colour options available in 2007 are the subtle Jet Black or vivid Tornado Red; both choices wear new, colour matched mudguards and wide centre stripe decal. A comprehensive range of accessories, including less restrictive silencers (not for use on the road), fly screen, soft luggage and various chrome additions further enhance the Thruxton’s scope for owner involvement and personalisation. 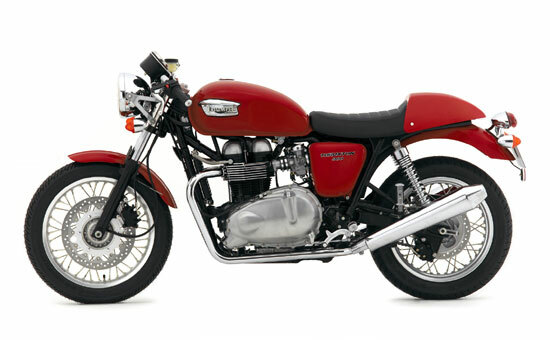 Triumph specialises in building unique bikes and with the Thruxton has defined a whole new category in modern motorcycling – retro sports. But if one lesson from the past has stood the passage of time, it’s that the basic essence of motorcycling transcends all technology. 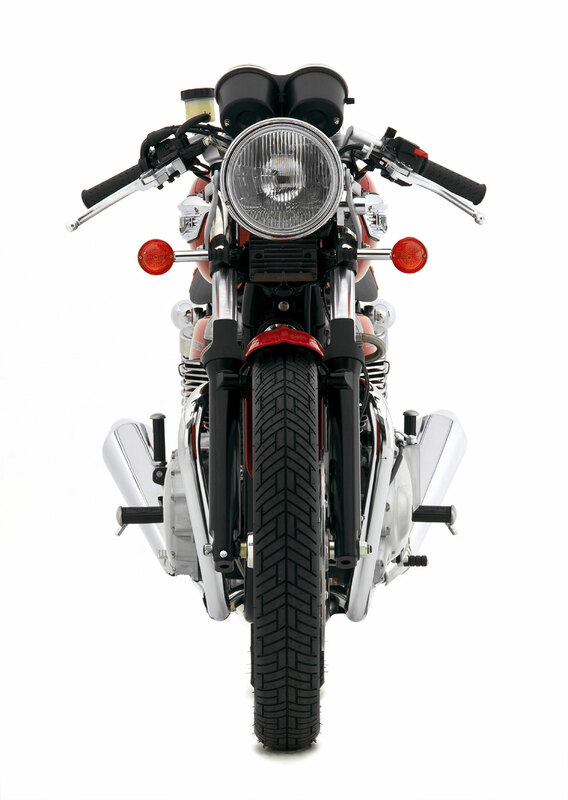 What a bike is, and represents to the owner, is very nearly as important as what it does. All that’s really needed, for many, are an engine, two wheels and a pair of handlebars. The Thruxton captures that spirit.